The exchange of presents is completed and the recycling bins are brimming with the discarded holiday refuse. The holiday feast has been consumed with the appropriate gluttony. Most of the crazy store sales have ended. For those of you who are reading this, the world did not end and you survived another holiday season. It is time to look forward into the New Year with excitement and hope. Time to make the New Year’s resolution. The New Year’s resolution has roots in ancient civilization. The idea of resolutions originated in ancient Babylon where promises were made to the gods of the time. Promises were made to return items borrowed and pay the debts to the debtors wiping the slate clean. Throughout the centuries, new creative ways to wipe the slate clean of the past and begin anew emerged. Modern resolutions tend to focus on improving our physical health with an over-priced gym membership or the reaffirmation to breaking nasty habits like smoking, drinking, or waking up next to strangers on a regular basis instead of being about a commitment to others. In other words, we make a conscious effort to begin each year setting ourselves up for failure. Now, that sounds healthy, doesn’t it? Before you declare your life changing commitments for the coming year, take a few moments to look over your resolutions from the previous years. Did you invest in the gym membership that went unused after a few weeks? Did you proclaim that this is your “last cigarette” only to go out a few days later to buy another pack? Maybe you promised to have a more positive view on life as you complained that it would be doomed to failure? Year after year, the same promises are professed only to be given up within the first six weeks of the New Year. I do not know how you feel, but if I failed in something 88% of the time, I might rethink my methodology. Personally, I would like to have six-pack abs and the endurance of a twenty-something year old, but the reality is the time and investment required to achieve these resolutions would only be possible if I was independently wealthy or unemployed. The former is not likely in the fore-seeable future and the latter is, shiver, not something I would hope for anytime in the near future. 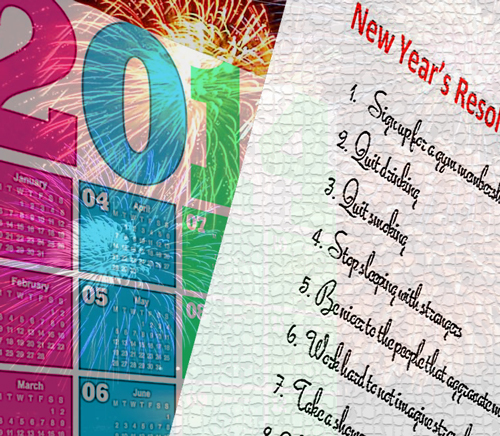 With New Year upon us, now is a good time to look at the exaggerated resolutions made in the past and learn from the mistakes. Start with something small and achievable to build upon in the years to come. Yes, it would be great to give more time to charity, become more pious in your devotions, or spend more time with family but let’s face it, if you have not been doing these things before now, you are probably not going to magically start just because the calendar year has changed. Try this for a resolution, become more realistic. Trust me, once you start down this path, you will have fewer issues with disappointment and less public humiliation. One of the major issues with New Year resolutions can be rooted in the idea that you will change everything about yourself. In a manic moment, a decision is made to become something that you innately are not. If the resolution can be rooted in your reality, the chances of success are likely to increase. To be successful it is time to change your perception of the commitment. This year, make a commitment not to make a resolution. Instead, begin with setting easily achievable small goals. A subtle shift in your expectations could mean the difference between the embarrassment of explaining the failure in your publically proclaimed resolutions and the actual achievement of your goals. Instead of professing, you will drop five clothing sizes, how about starting with something a little more realistic, like not having that second (or third) portion of dinner? Refrain from swearing off drinking and maybe just plan on curbing your Friday night drunk fest that leads to the walk of shame on Saturday morning. The little things mean the difference between utter humiliation and potential success. For the readers who have already gone out and purchased a new workout outfit, signed up to the over-priced 24-hour gym, and scheduled your personal trainer congrats. For those that are planning to swear off the booze, I raise my glass of New Year’s cheer to you. We will look for you around the end of January and have the barstool saved for your return. To all the smokers that are planning to quit, please make your intension clear so we can avoid you and your surly mood for the next few days. I wish you all the best of luck and just know that we are secretly taking bets on the outcome. I am glad you enjoyed today’s article. Hope you had a great New Years celebration. My only resolution which technically isn’t a resolution is to be happy. Its the same one I make every year. Seems to be working out pretty well for me the last few years. That sounds like a great way to live your life. To strive to be happier today than the day before. Congrats on your success with your previous years and best of luck in the coming year. Thank you for following my blog. I am following you as well. Happy new Year. It is always a pleasure to discover new blogs. I will look forward to your upcoming post. Happy New Year to you as well. Those ancient babylonians had the right idea! I think I’ll take a page from their book and try to repay my debts this year.